Generating income through social network sharing using Po.st Wordpress plugin! Want to know about a great Google Adsense alternative for earning income through your blog or website? Have you tried Po.st revenue generating tools offered by Wordpress? Please read further to know the features of Po.st Wordpress plugin that helps generating income through social network sharing. You will be surprised to know that it is possible make money online with Facebook sharing or Twitter sharing. Understand the tips to make money from social media sharing through Po.st social sharing plugin. The next time you are accused of spending too much time on social media – you can quite confidently say that you are making money by simple and innovative methods. One of the most common of these blog revenue generating methods is Po.st. A totally free Wordpress social sharing plugin, it is the only social sharing platform that helps you earn money by just adding a 'sharing' action on your website. Definitely one of the most innovative methods to earn money on the internet today! There are at present 1000s of publishers that are using this method to bring more revenue. In absolutely no time, you can have the Po.st social button on your website and thus be able to get content from your website distributed and earn income. Of course, it serves as a popular Google Adsense alternative to make money from blogs or websites. Well, the obvious question – how does this work? There are different methods through which a user can start making revenue from this model. The preferred method is 'After the Share' advert. The approach is quite simple, when a user shares any possible content through your website; they receive a pop up confirmation that suggests that a share has been completed. This is when an advertisement is shared to the viewers and that can be shared to gain revenue. The advertisement is uniquely suggested to increase the chances of a share from the user. The copy & paste sharing technique is a feature that would get users to share content available simply by copying and pasting a particular section of a page. This is done easily by a widget that pops up when a reader highlights specific content and then asking them to share the information. This does make sharing very easy and hence more people read their articles. Wordpress social sharing buttons help getting more people to see the shared content and hence you get better conversions. All of this is done with the help of RadiumOne. This is Po.st's parent company that figures out relevant advertising spaces to give out to each unique viewer. In the case that you have a sales team, you can add this inventory with the adverts that you make or drive to. The ad is in the form of a 300X250 banner ad image and the payouts are quite big. These advertisements pay out in relatively good CPMs and the best feature of them all is that they do not ruin your website aesthetics. Moreover, you are looking at segments upwards of $25 as CPM rates – definitely a notch better than most other payers. The first step is to implement the tag on your website. This is quite simple. You can add this to the java script tag so that it is displayed to all the sharing buttons you have chosen. Once this is done, you can paste the code provided to all the pages on your website. This pretty much implements the tag on your website. After this, you need to get in touch with the Po.st team at publishers@po.st and intimate them to see the love status of the page. You should add the URLs that are present and how action is taking place. Once confirmed, an account is created in the RadiumOne ad system and you can track down the revenue you have generated every hour. This gives you clear and updated information through the day and the payment terms are quite friendly too – you get a payment waiting of 45 days from the end of the month and there is a minimum of $250 in your account. One of the bright features of po.st is that you are able to live it up in many channels. This is possible in over 50 social media channels like Twitter, Facebook, Pinterest and many more. Not just that, you have different icons for each of the platforms giving it a customised approach for each of the sites. The entire theme of po.st is to make it easy for any consumer to share content. You can share any publisher's content and hence attract new people to your blog or website to increase traffic. The moment someone shares you content, you receive a social stamp and while it is a lot similar to traditional referral processes or popular blog revenue streams, the simple benefit is that there is more reach a new person shares the content put up to their social profile. You would be able to market your content extremely easily and thus get more people to know about the content you are promoting. It is important that Po.st shortened links are inserted directly in posts, tweets and possibly every other form of social media. This would get people to keep all the content sharing links short and branding is done in a smart medium too. Apart from this, there are social sharing buttons that are on the website directly too. You can get all your content aggregated at one spot. 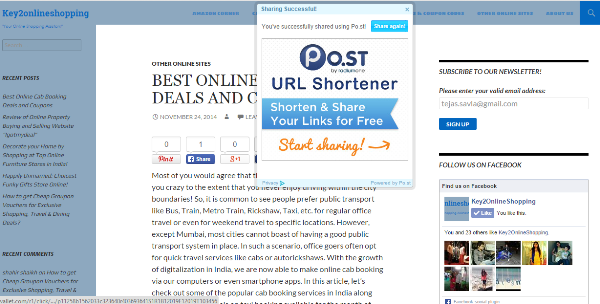 The Po.st link shortener is a great way to push content quickly. Facebook is a great place to get the ball rolling here to be honest. The possibility of having content shared is extremely easy and hence a better chance of conversions. There is also a lot of attraction for online money making with Facebook sharing. With a lot of volume present there, there would be a huge base to target. I was already aware of po.st social sharing plugin for Wordpress. But I never thought I could make money with po.st. Thanks for sharing this info. You are welcome Muddassir Husain. Yes, please do give it a try. The earnings won't be great initially, but with more traffic you can make a few extra bucks. Plus, it's an innovative earning option that doesn't involve displaying any ads on the website. You earn when someone shares your content.